I feel relieved now that I had my say and I would love to continue blogging in a more cheerful and positive way ^^ I promise I will try to never put up that much text without images again, haha! Here’s my second polyvore creation! I again got myself inspired by a wedding video I saw. I believe it was from Paperback weddings, but I kinda forgot the link. Whoops. I for some reason suddenly feel like wearing flower brooches! Maybe you’ll see them around on this blog more often. Just sayin’! LOVE THE COLLAGE!! ESP THE POLKA DOT TOP! That green necklace is so pretty, and flower broaches would be so fun to wear – you definitely should! Vind de bib-necklace een topper! jammer dat-ie zo duur is, haha.. had hem meteen gehaald! Love the green necklace and jean top! Great items! Ik weet trouwens precies wat je bedoelt in je vorige post. Ik krijg ook veel van dat stomme commentaar van mensen die willen weten wat ik weeg en hoe 't dan kan dat ik zo weinig weeg etc. Zo zijn we nu eenmaal gebouwd, 't is inderdaad niet altijd ideaal, al snap ik wel dat al m'n vriendinnen jaloers zijn dat ik in principe iedere dag frietjes kan eten zonder aan te komen. Maar niemand kan me kwalijk nemen dat ik niet genoeg eet en dat ik 'het verkeerde voorbeeld geef'. Mensen die dat zeggen zijn jaloers en bovendien erg dom. I love the bright yellow flower! Gorgeous! Be sure to enter my £100 ASOS giveaway! Love the polka dot cardi and flower brooch, super cute. That necklace is stunning – so pretty! Oh, and i CANNOT wait to see what your 'challenge' is! you have me so intrigued. I love Polyvore! And is that banner new? I got new glasses, i noticed you did a while back too! I love brooches as well. Love the yellow, nice picks! I'm such a fan of this Polyvore set! The yellow and turquoise are awesome colours together and the accessories are totally grounded in neutral yet still interesting pieces. Lovely! 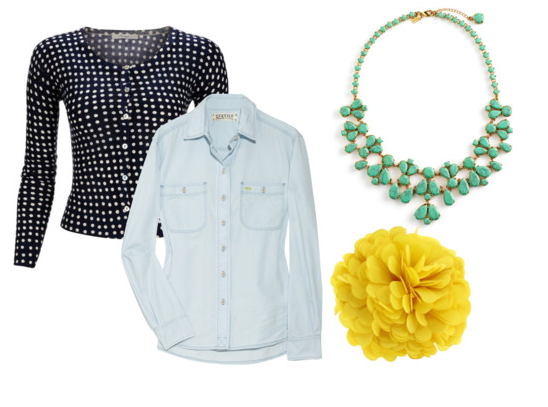 love the denim shirt and green necklace – so cute! I was just thinking that I really need a polka-dotted shirt. Now I'm convinced and I need a big yellow flower to go with it. LOVE the combination! Wonderful combination! Love the green necklace. Why would people tell you to eat more?! We come in all shapes and sizes. what a lovely polyvore creation! I reeeeeeally love that necklace with that brooch. great colors! cute little collection, love it! loving the denim shirt! i've been looking for the perfect one for ages! I love the necklace so so much! I read your previous post (and by the way your english was great! ), and was blown away by how beautifully it was written. what you stated in your writing was so true. Women of all shapes and sizes should be celebrated, and whether you're 'too skinny' or 'too overweight' shouldn't ever matter. All women are beautiful. Dat hemd + die ketting = mooi!